Summer’s here and everything around Minneapolis seems green and thriving. But perhaps you’ve noticed some of your trees and shrubs showing yellow leaves with green veins. This is usually an indication of micronutrient deficiency. 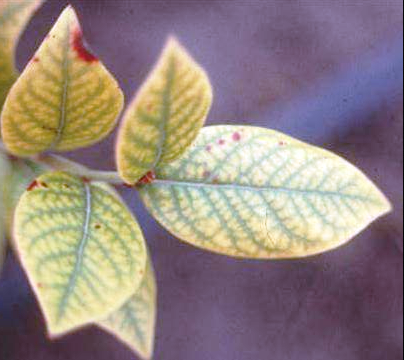 These deficiencies – called iron chlorosis – commonly show the symptoms of yellowing between the veins of the leaves. This can cause problems including discolored leaves, poor health of the plant, and the death of a plant. Iron is an essential nutrient that is required for producing chlorophyll, which provides the green color in leaves. Water and sugar combine to produce energy for the plant when sunlight is present. With a lack of iron, chlorophyll isn’t produced and the base color of the leaves, which is yellow, becomes visible. The problem does not always manifest itself. For example, trees may show symptoms one year but not the next. But if it is serious, it will continue to show up yearly, and the tree will deteriorate further in subsequent years. In North America many areas have alkaline soil pH. In the Upper Midwest high soil pH and iron deficiency is well known. Iron deficiencies occur when soil is wet for a long time. It also appears where trees or shrubs have had damage to their roots or trunk systems. It also exists where there are low levels of iron in the soil, like sandy soils. The way to treat it is to identify any causes, look for contributing factors, and then develop a treatment plan to address the problems. The most common problem found is that the soil pH is 7 or higher. It can also appear in heavy clay soil, due to compacted soil due to construction, damaged root systems of the plant through construction, or extensive soil filling. For small trees and shrubs, multiple applications of sulfur is used when the soil is alkaline. In larger trees, injecting the trunk with an iron compound is required. An arborist can help address these issues. Trees and shrubs are important components of many landscape designs. Spotting problems and correcting them means you’ll continue to enjoy their beauty and shade for years to come.